With the Internet of Things slowly becoming mainstream the potential uses of this technology can also be seen in the Education sector. This blogpost is the first installment of a series of posts that highlights practical examples that can be used in teaching and training. Noise pollution has been a serious problem in many large cities all over the world and with the help of common mobile devices (smartphones) this can be easily measured, monitored and compared with a large quantity of samples from other cities/regions. 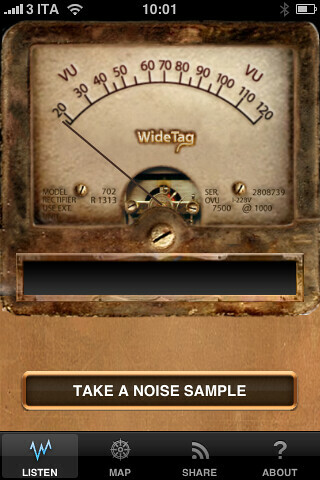 With WideNoise users can monitor the noise levels around them using an App downloadable from Android Market or Apple AppStore. It has geo-location capabilities allowing users to also check the online map to see the average sound level of the area around them. The project has made it’s source code available via an Open Source license allowing further customisation. A project developed by Sony Computer Science Laboratory Paris & VUB BrusSense group allows a user to measure the level of noise in dB(A) (with a precision a bit lower than a sound level meter), and contribute to collective noise mapping effort by annotating it (tagging, e.g. subjective level of annoyance). This information can be automatically published on this website (3G/GPRS or manual upload on any PC). These two projects provide an excellent starting point for educators to become involved on the ‘Internet of Things. A copy of this can be seen on my work blog as well.